Use paper muffin liners or lightly grease muffin tins with butter. Place your oven racks on the lower side so top of muffin will be in the center of the oven. In a medium sized bowl combine flour, baking soda, salt, cinnamon, cloves, and nutmeg. Set aside. In a large mixing bowl cream together the butter and sugar with an electric hand mixer on medium speed until fluffy. Add the egg, beat on low speed until incorporated. Add the flour mixture 1/3 at a time and beat on low speed after each addition until combined. Using a wooden spoon, stir in the apple cider. Peel four of the apples and then shave or grate the apples using the second largest setting on the side of a box grater. Take apple shavings and lightly pack into measuring cup until you have 1 slightly heaping cup of apples. Turn apples out onto a board and dice shavings a little. Note: muffins require much less baking time than bread or cake so the fruit needs to be tiny in order to get the flavor evenly blended otherwise you get chunks of half-cooked gooey fruit. Stir apple shavings in to batter with a spoon. Fill muffin cups 3/4 of the way to the top. Bake 20 min, or until muffin top springs back when touched. Remove muffins from pan immediately when done. In Recipes-list.com we have selected the most viewed recipes from category - uncategorized . Enjoy the best recipes specially selected for you! 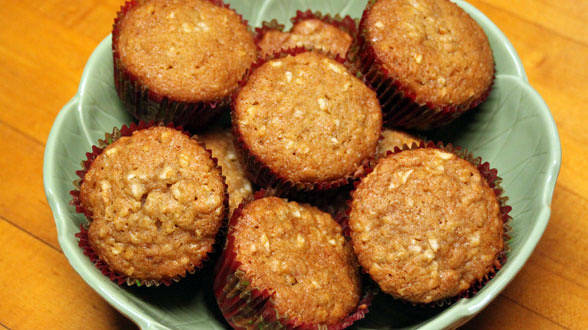 Apple Muffins is the right choice that will satisfy all your claims.